Fertilizer is “in the news” in the area recently because of the Fertilizer Use Act of 2011 for Maryland, which limits the amount of nitrogen and phosphorus that may be contained in lawn fertilizer products and also puts restrictions on how and when homeowners and lawn care professionals can apply these products. Although the Maryland law will not officially go into effect until October 1, 2013, Maryland State Agriculture Secretary Buddy Vance is encouraging homeowners to start implementing these changes now. "According to our state chemist here at the Maryland Department of Agriculture, about 44 percent of the fertilizer sold in the state of Maryland is applied to lawns - that's a pretty amazing factoid," Maryland Agriculture Secretary Buddy Hance said during a press conference Monday. "Everybody assumes that agriculture is the biggest user, but lawns use almost as much fertilizer." One of the main changes from the Fertilizer Use Act will be the amount of nitrogen and phosphorous that is contained in fertilizer. Nitrogen and phosphorus are key ingredients in lawn fertilizer, but can be harmful if used in excess. When it rains, these nutrients can wash into local waterways and eventually into the Chesapeake Bay where they can fuel the growth of algae blooms and threaten underwater life. 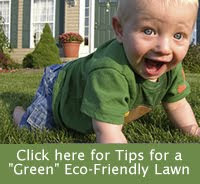 Jon Traunfeld, director of the University of Maryland Extension Home and Garden Information Center, suggests that homeowners get their soil tested to determine the exact fertilizer needs of their lawn and also suggested that homeowners use compost to supply these needs.